You know that feeling when you walk into the store and you see that *something* you didn’t know you needed? Well, that’s exactly how we felt when we were chosen to review the Yearly Membership from SchoolhouseTeachers.com. Holy Moly… what a resource! I honestly do not know where to begin with this review. There are SO MANY great things to write about. I can’t possibly write about everything on their site… you might be reading for a week! Allow me to start with the basics! 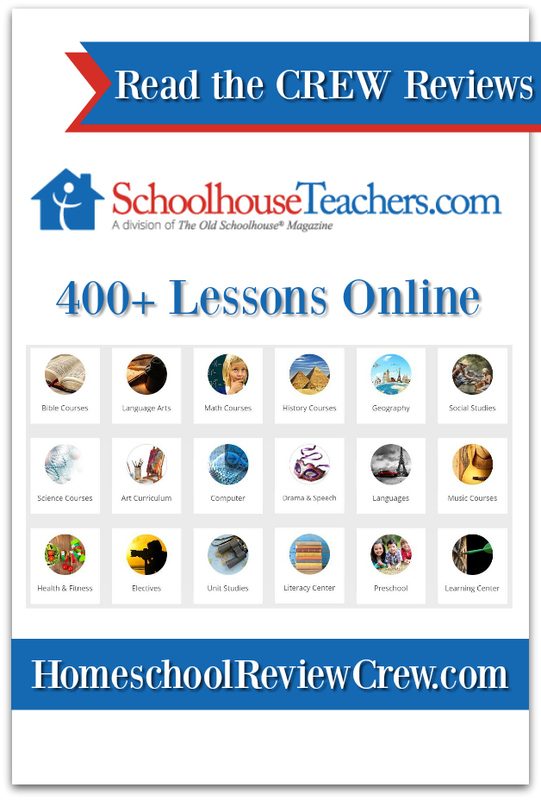 SchoolhouseTeachers.com is an online site that offers over 360 courses from grade levels – Preschool to High School. There are also courses for parents, too. Each course can be started and completed at any time, allowing your child(ren) to work at their own pace. The yearly membership is for the entire family. Making it very affordable and a very thrifty homeschool resource. In addition to the vast array of courses, there are amazing homeschool planners, schedule building tools, record keeping, and so much more! SchoolhouseTeachers.com is fairly easy to navigate. It has wonderful drop down menus and clickable links. Finding what you’re looking for is a breeze with the option to search or browse by subject, grade level, or scope and sequence. About the Courses and Lessons. When clicking on a course or lesson you have the option to to discover everything about it before you choose it by clicking the ABOUT button. Or, if you know it’s the course you want you can simply go directly to the lesson and get started. Lessons can consist of printable PDF’s, Videos, printable Worksheets, Online Reading and more. Everything you need to complete the course is included. One of the aspects I thoroughly appreciated were the full lesson plans. Of course I haven’t clicked on every course or lesson they offer (again… over 360 – that might take a while) but what I have viewed, (and we started using) the full lesson plans seem easy to follow and complete. As you can see in the picture above, there’s a plethora of subjects and topics to choose from. You could pretty much plan your entire school year based on the variety they offer. *Side note: There are many online sites on the web, but what sticks out to me is that SchoolhouseTeachers.com offers a great deal for Middle and High School range. I have found that most sites cater to the younger grades. The fact that there is a wide variety for EVERY grade level is impressive to me. Included in the membership is access to World Book Online. You might recognize the name World Book. That’s right, it’s the encyclopedia company. Your Yearly Membership includes access to World Book Online. Tons of info just waiting to be researched. There’s also an entire Video Library that the whole family has access to. There are hundreds of streaming videos from providers including Creation.com, Drive Thru History, Vision Video, Discovery House, Boat Angel, City on a Hill, RightNow Media, and more. Many of these videos are included in lessons, but can be viewed anytime in the Library – without doing the lesson. What we’re enjoying so far. Our list of courses to use is quite extensive, but we had to start somewhere, right? Our Middle Schooler was beyond exited when we found the Micro Business for Teens Course. She is learning how to hone in on her talents and interests, along with praying about her direction. Brainstorming a business plan, marketing plan, and even taxes. She was blown away with some of the tax laws that even, she, as a teenager would have to abide by. This course counts as a Business Elective and can be included on Transcripts. Our Elementary aged boys are currently working on Comprehensive Skills in the Literacy Center section of the site. The Literacy Center is great for all stages of readers. You can go through the steps as they have them laid out or many of them are included in other Language Arts courses and lessons. I picked Comprehensive Skills to encourage deeper thinking skills in reading. We typically will read a book together and work on the steps given. Answering questions, looking at informative posters (PDF), and discussion. In the World Book section, our youngest son discovered a fun multiple choice game called “Save The Sentence!” The object is to find the misspelled or grammatically incorrect word. Surprisingly enough, he loved this game. I loved the fact that he was learning and viewed it as a game! The fun didn’t end there for our kiddos. During lunch we would put on the Drive Thru History videos. These videos are amazing and educational – in a fun to watch format. Let’s face it… not everyone enjoys History. I’m all for lessons that are fun for everyone… including the teacher/parent. You can choose to answer questions after the video (PDF). WOW! This was a long winded review. There’s so much happening on the SchoolhouseTeachers.com site, I want to tell you about it ALL! Check out the trial offer they have going on. A great opportunity to try before you buy. You will have the opportunity to explore the site for an entire month for just $5. That is one thrifty deal! Be sure to check SchoolhouseTeachers on Social Media, too. Update: Check out the current reviews by clicking the image below. src=”http://ourthriftyhome.com/wp-content/uploads/2017/02/Homeschool-Review-Crew-Disclaimer-1.jpg” alt=”” width=”728″ height=”90″ />Why you find reviews here at Our Thrifty Home. Previous Post: Why I write reviews!